Where you hand out free cups of coffee, people will follow. 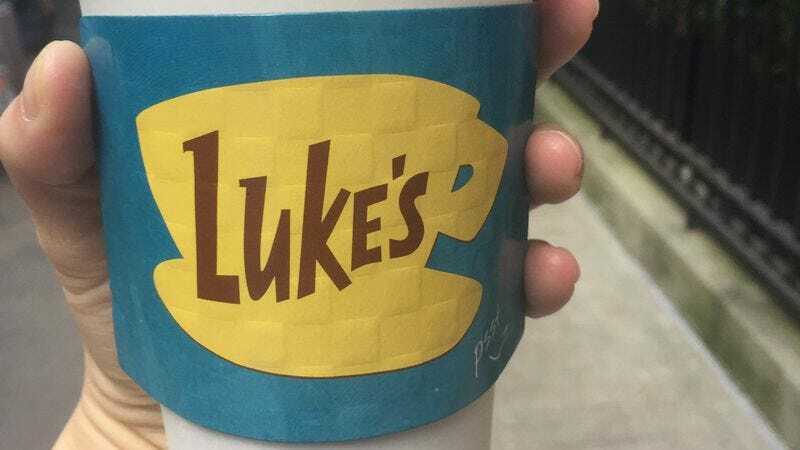 That’s what Netflix did for Gilmore Girls’ 16th birthday—the show premiered October 5, 2000—dressing up coffee shops around the country as Luke’s and handing out a limited amount of free java in commemorative cups and sleeves. Meanwhile, Netflix released a featurette intended to hit all of your nostalgia buttons, combining old footage from the series with reminiscences from the cast. At the “Luke’s” locations The A.V. Club checked out in New York and Chicago—Local and Osmium Coffee Bar, respectively—we found long lines of people waiting to spike their mornings with a hint of Gilmore. A rep at Local explained that people started queuing around 6:30 a.m., a half hour before the shop opened up. In about two hours 150 cups had been given away. (Though we were told there were 500 available at the location, past 250 fans had to pay up.) Both spots were adorned with Luke’s signs, and warnings from the crotchety diner owner himself. While some of us opted to take part in the actual consumption of coffee, A.V. Club contributor Myles McNutt wanted to preserve the sanctity of his souvenir.